Texas Instrument first graphing calculator that operates more like a Computer . Simpler keypad with separated alpha keys makes navigation through screens, menu and math objects easier. •Graph it - The new Scratchpad on the enhanced home screen allows you to quickly perform calculations and graphs without saving your work. •The student software enables your home computer to function just like the handheld graphing calculator. So you can use the larger screen to easily create, Edit and transfer TI-Nspire documents between computer and handheld. •Save it - Just like a computer, you can save your documents. •Print it - Print out documents easily. •Share it - Share TI-Nspire documents between calculator and computer - and with your teacher. •Permitted on SAT, AP, ACT, IB, PSAT/NSMQT, and Praxis exams, as well as many state tests. •USB port for computer connectivity, unit-to-unit Communication with other TI-Nspire family handhelds, and more. As a mom, I like purchases that are more of a long term investment. If my kids can get many years of use from one item ( growing with them rather than them growing out of it) I'm in! There are so many useful functions to this calculator - you can use it for the simplest math and the more complex math presented in Middle School, High School, and College. I was very impressed with the touch screen and computer like functions of the TI-Nspire, and it's wide range of capabilities. You can even connect the TI-Nspire to your computer and download / print your work! I wish this model was around when I was in college! I'm sure that B will get many year's of use out of this great device. 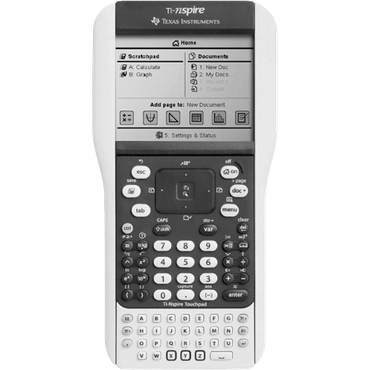 You can find the Texas Instruments TI- Nspire with Touchpad at a retailer near you! One Lucky Reader will receive a TI-Nspire with Touchpad and a Texas Instruents "Math Rocks" T-Shirt! Leave a comment~ Which of the TI-Nspire's Features are you most excited about? The Comment is considered your entry. Entry to this giveaway ends at 12pm PST October 7, 2010. Winner's are chosen randomly through random.org. The winner will be announced in a post within 7 days of the giveaway ending, and contacted through email. The winner will have 48 hrs. to respond or another winner will be chosen. Just like a computer, you can save your documents and also print it. To be honest I don't know much about calculators but my husband would absolutely love this. and Christmas is coming up so it would be perfect! I like that you can save your work/documents and then print them out! I love this. The fact that you can see one thing more than one way is awesome. What a great gift this would make for my husband who's headed back to school after being out for 6 years. i could really use this for school!! love all the features! I like that it's easier to navigate than the previous versions! I really like the screen size. It would be less stressful on my children's young eyes. I am most excited about the touch screen feature! I'm most excited about the USB port to connect the calculator to the computer. Gotta have this for my wife. What a gift for the math addict. I love that it is permitted on many of the state exams. I am most excited about the split screen and seeing multiple representations of a single problem. The student software enables your home computer to function just like the handheld graphing calculator. So you can use the larger screen to easily create, Edit and transfer TI-Nspire documents between computer and handheld. Follow you on twitter as hhhnp12. I follow publicly on GFC and the feature I'm most excited about is the student software that enables your home computer to function just like the handheld graphing calculator. So you can use the larger screen to easily create, edit and transfer TI-Nspire documents between computer and handheld. Thanks for a great giveaway! What a great calculator! I think the USB port to connect with the computer is awesome! The feature I like most is the GraphIt - I love using Graphs for many things, business related.